It’s that time of year in Arizona again. Triple-digit highs for weeks on end, and lows that the rest of the country uses for highs. 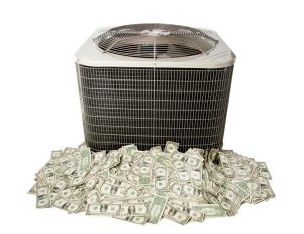 If you are like many in the Valley of the Sun, your monthly air conditioning bill is likely anywhere from $400 – $700 (some even higher). In many parts of the country, people can choose to be a little uncomfortable to help save on their energy bill. But in Arizona summers, that’s simply not an option due to the real risk of heat exhaustion and dehydration. Our houses would become ovens that literally would “bake” us alive! With no way to lessen the amount of time our AC units run, we must do the only thing left: ensure our homes are able to cool as efficiently as possible. That’s when AZ Energy Efficient Home can help homeowners. Our expert professionals will inspect every aspect of your home to make sure it is sealed properly, reducing the amount of cold air escaping to the outdoor heat. We’ll also check the HVAC unit to make sure everything is clean and functioning properly. Most of the time, an AC won’t just cut off when something first goes wrong. It will just work harder, meaning there is a higher consumption of energy being used (and therefore you will pay more) to keep your home at the same comfortable temperature. As an APS and SRP certified contractor, we will help Arizona homeowners enjoy Energy Star rebate options on an energy audit or retrofit necessary repairs. Our quality assessments could also include an evaluation on other home dangers such as allergens and carbon monoxide. When your house is efficient and safe, it saves you money by reducing how much you are paying in energy and possible medical costs. But more than that, AZ Energy Efficient Home possesses the expertise to make your home a safe-haven and a place of comfort. Don’t guess your home is healthy and energy efficient- ENSURE IT IS! Contact AZ Energy Efficient Home to schedule a home audit assessment.